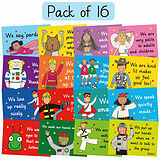 Pedagogs Collector Praise Cards, 200 cards per pack with 8 designs (4 boys and 4 girl). Each card is 88mm x 54mm. Child friendly drawing style by The Pedagogs. 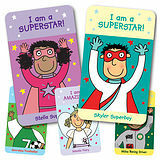 Children love collections of things and this reward is based on collecting 4 cards. Once they have collected 4 different cards, they fit together to reveal a secret message on one side.